In the past, the Climate Column has discussed practices such as strip-till, no-till, and cover crops to prevent erosion and improve soil health. Another important practice with similar benefits is the establishment of field borders, strips of vegetation at the perimeter of a field. Generally composed of stiff-stemmed upright grasses or legumes, field borders can protect soil and water quality, reduce erosion, provide food and shelter for wildlife, serve as pollinator habitat, and manage pest populations. Field borders can be implemented in conjunction with other buffer practices around or between adjacent fields, and can even be placed around the entirety of a field in order to optimize resource protection. The USDA Natural Resources Conservation Service offers tips on how to reap maximum efficiency from field borders, recommending they be used alongside other conservation techniques, such as no-till or cover crops. 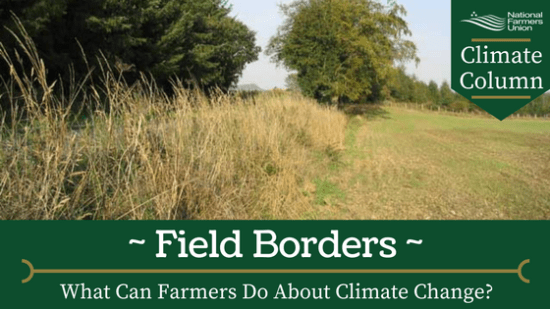 Are you a farmer that uses field borders? If so, how has this impacted your farming operation? Let us know your thoughts in the comments section!